Wannsee - In A Berlin Minute (Week 158) from Luci Westphal on Vimeo. 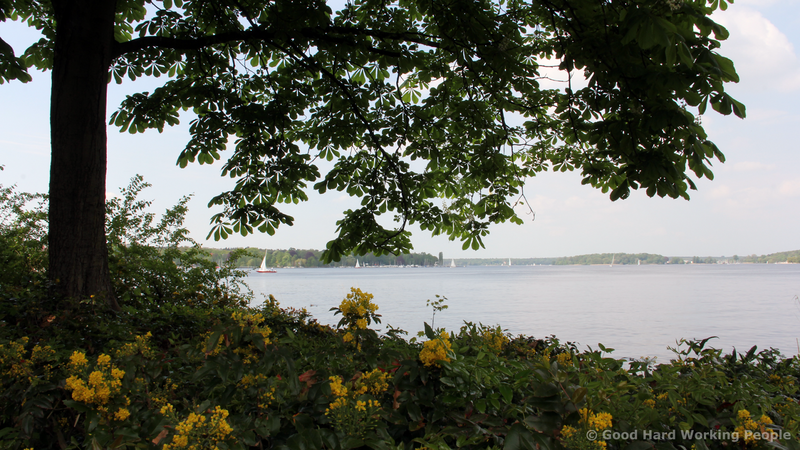 The famous Berlin lake Wannsee is really two lakes, Kleiner Wannsee and Grosser Wannsee, that are bights of the river Havel. In this video I only show a small part of Grosser Wannsee (Large Wannsee), including the popular public beach Strandbad Wannsee - after hours. There would have been a lot more to see, but according to my new to not go overboard (no pun intended), I decided to keep it simple and not include the villa, where the Wannsee Conference took place or any of the islands and bridges. What fascinates me most about this area, that during the East / West Germany split, it was the only real big "get away from the city" nature that people in West Berlin could access without leaving "the country" and getting the permission to drive through East Germany to reach West Germany. Kind of mind blowing. If time allows I plan to return to the lakes for a boat tour and to visit the Pfaueninsel (Peacock Island). At this point it seems that winter has quickly turned into early summer. It seems the whole city has breathed a sigh of relief. The music is a track from Soundtrack Pro mixed with the natural sounds around the lake.